This Sunday, July 24, is the 17 Tammuz fast day, on which we refrain from eating and drinking from dawn to nightfall. It also marks the start of a period known as "The Three Weeks." The Fast starts at 5:11 am and ends at 8:44 pm (times local to the Clear Lake Area). 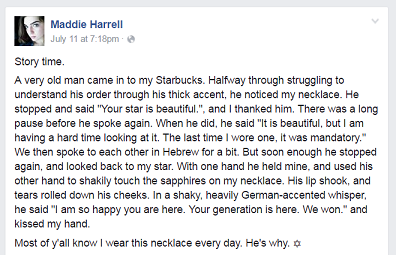 When Maddie Harrell, a Chabad Bay Area community member, posted an encounter she had with one of her customers at Starbucks in Clear Lake, she never imagined it would go viral! In conversation with The Jewish Wave Thursday night Maddie related that her post was in the top ten trending posts of the day on Facebook and she's been receiving an incredible amount of supportive messages from people around the world who have become inspired as a result of her post to take even greater pride in their Jewish heritage. Check it out on FB. 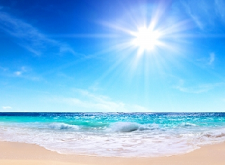 Tuesday - Inaugural Summertime Parsha Class! Open to Everyone & Free of Charge! 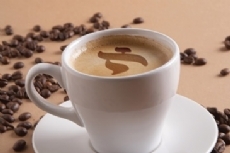 Please note that Coffee & Kabbalah and Shabbat prayer services will not be held this Shabbat - Saturday, July 10. Regular schedule will resume next week. 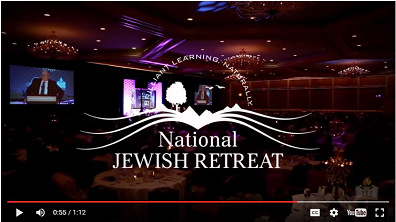 The National Jewish Retreat will be held this August at the luxurious JW Marriott Desert Springs Resort & Spa Palm Springs, CA. Find out more at www.jretreat.com. This Shabbat we will be joined by a participant who is in the middle of Shiva - week of mourning - after the passing of his father. Thus, it is of extra importance for us to have a full Minyan. Your assistance is most appreciated! Join us this Shabbat morning for a fascinating and inspiring class on Kabbalah.